Sore thumbs? Aching wrists? All those wonderful trigger-points and acu-points feel so good for the client, but usually leave our knuckles and wrists feeling like they've been run over by a truck. That's where thumb-savers (or T Handles) come into the picture. There are several models available commercially, but are often very expensive and sometimes the quality is dubious. The last thing you want is for one to break and injure the client. For the handyman/woman with even limited carpentry skills, here's a cheap quality alternative you can make in five minutes for around $10. The only tools you will need are a drill, wood glue, and a file. 1 x 10mm rubber floor-saver (like the sort that fit under the feet of chairs). Mark the centre of the shovel handle's belly and using a 12mm bit, carefully drill a hole half way through. Cut the dowel, then apply a small amount of glue to one end. 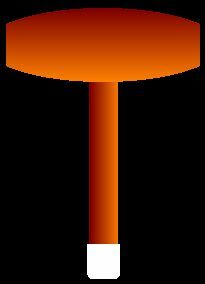 Gently tap the dowel into the shovel handle until it is nestled tightly in the hole. There should be no movement at all. File the rough edges off the other end of the dowel, then slip the floor-saver over it. The fit is designed to be tight, and will create a tapered effect to the point. If the floor-saver is too tight, put it in hot water for a minute to make it more pliable, and it will slip over easily. File off any splintery bits that might remain. And that's it. After a few uses, the massage oil from your hands will penetrate the timber, giving it a beautiful smooth finish. Don't be tempted to varnish or paint your new thumb saver, as many commercial coatings react badly with massage oil and can have a toxic effect on your skin. When using thumb-savers, remember that you no longer have the absolute tactile sense that you had when using your thumbs and knuckles. You need to constantly check with the client that the pressure isn't too hard. Eventually you'll learn how to tell, but it takes time and experience. I've used the very same thumb saver for nearly twenty years and I couldn't do without it. Stick with it, and you'll find this is a great tool to have in your kit.